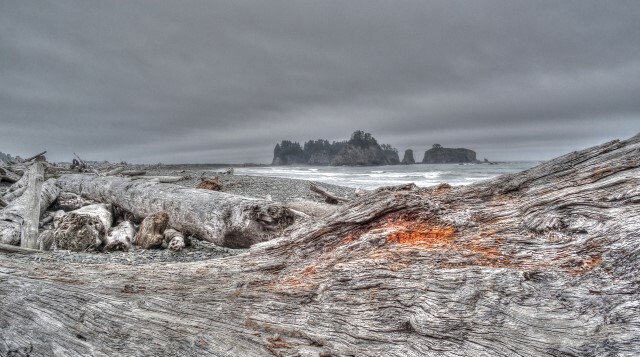 I really wanted to visit La Push and Rialto Beach. How much did I want to visit both of them? A whole heck of a lot. My dad used to say fishing out of La Push was phenomenal. Well, of course, it would be since salmon run to and from the mouth of the Quillayute River at this location and directly into the ocean. I’ve been on a lot of beaches. All beaches certainly are not the same. Some are sandy and some are rocky with a lot of different ones in between. You can view them from cliffs above or even right at the level of the rolling sea. However, I was not prepared for this beach. I was caught by surprise. This is the perfect beach for me. Well, there are several of them here. Some with rocks, some with sand and lots of trees and driftwood that the mighty sea has carried to this spot. Our first peak was from LaPush and then around to First Beach. LaPush is on the Indian Reservation of the Quileute Nation. 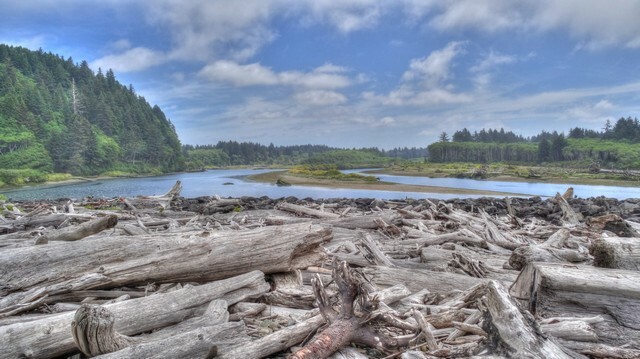 Much of the northern Washington coast is wild and undeveloped. This beach was a rare find in the lower 48. About 73 miles of this wild coast is protected land as well as over 3,000 square miles of marine waters, trails and overlooks. During the summer waves roll to and from the beaches in this area. At this time the waves are gentle but in the winter those waves can be entirely different. The winter storms bring a whole new look to the sea and those gentle summer waves. Taking a picture of the Quillayute River which flows into the ocean, I captured blue skies and blue water. However, just turning around the picture was entirely different. That picture was of the cloudy beach and Pacific Ocean. At first I wondered if the clouds were coming or going? Well, they were going … at least while we were there. Then, on to Rialto Beach and many more logs. The logs end up at Rialto when swollen rivers have undercut their banks and carried them down to the ocean. The ocean tossed the logs onto the beach. Some of the logs we saw will remain there and others will be carried to a new resting place when winter comes. Okay, so these were a few fun beaches to take pictures of and play a little with toning, HDR and even sharpening. It wasn’t enough though because we wanted to walk to Second Beach. It seems everyone else wanted to do that too and the parking lot was full. The sun was supposed to peak out behind the clouds on Sunday. When we left we intended to make the short drive back on a sunny day and try again. There is more around this area than just the wild Washington coast. This area is at the base of the Hoh Rainforest. We’ve been to rainforests before but this one is very different. The trees are different and we know it’ll be around for a good long time where some of the others we have visited may not be. The Hoh Rainforest is protected and there is no cutting down of trees or scalping of the landscape. Even the wildlife are protected here. We like that. Even though the areas around the rainforest may average 30 or 40 inches of rain per year, the rainforest itself gets from 140 inches to 170 inches a year. Now that’s a lot of rain. However, it wasn’t raining when we were there. Thank goodness for that. The visitor’s center is just under 19 miles off of hwy 101. 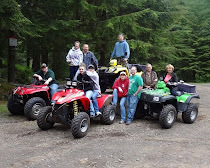 It’s a nice drive along the Hoh River with tall trees and several places to pull off. There’s even a restaurant along the way. We were now only 10 miles from Ruby Beach …. another must-stop. It was another beautiful beach. At this point we had to make a choice. We could go a little farther down to Kalaloch Beach or head back to the RV in Forks. The problem was our fuel tank was almost empty and there weren’t any gas stations according to Mr. GPS for quite a ways if we continued our journey south. Thus, we made the obvious choice and turned around. The Shell station was about 25 miles north. There is much more to see and we knew we weren’t through checking out this wild Washington coast but it would have to be another day. Due to economic cutbacks, the light at the end of the tunnel has been turned off! Absolutely beautiful photos of those beaches. One of these days.....we're going to have to check that area out. Another wow blog from you! What fun. You reminded me of the time I found apiece of driftwood along that coast that I just had to have. It traveled all the way back to Minnesota on the hitch of our popup trailer. It was so big it barely fit in the space I had marked out for it. I am quite sure Dave didn't think it was worth the hassle but I really liked it. Are you two in God's country or what! What an absolutely gorgeous area. Fabulous photos. You out did yourself girlfriend! More awesome pics of some beautiful scenery. That's a lot of driftwood. You don't see that on the East coast. It is quite something to see. I guess if you want a campfire, you don't have any shortage of wood. Just so beautiful. How much of that driftwood did Terry bring home with him? Truly a great photo tour! How did you manage to be there with no rain? Better buy a lotto ticket. It's all in planning the right time to go. Beautiful post Jeri....the wild Washington coast is definitely on my "to see" list! We are thinking of making the trip next summer...I sure hope it works out for us! I'd look at late July into September for best weather. All the photos are beautiful and he HDR ones are magical! I love the cupcake rocks with the pine tree frosting in the first ones!! We are looking forward to spending a few weeks in that area next summer and your post further confirms that plan :-). I didn't remember the rain forest was close to La Push - even better!! it's a gorgeous area and I would certainly look at planning it late July until mid-September.